Of course, like any Sensitive Soul like myself, at the sight of the word ‘wool’ I instantly smooshed the ball right onto my neck and cheek for a quick ‘patch-test’! I needn’t have been worried – not a scratch or tickling itch in sight! ‘Peacock’ seems a fitting name for this particular colourway, as it changes colour constantly when it’s moving, a gorgeous subtle blue-indigo-green hue. I wanted to show this off to its best, by choosing delicate projects with plenty of cables, twisting and turning. In my years of knitting I’ve never made a piece of jewellery before, and thought this would be perfect for this lace weight silky yarn. Each 25g ball provides 150m of yarn, which I found to be plenty enough for two necklaces! In my fledgling jewellery escapade I chose Olga Buraya-Kefelian’s Cable Braided Necklace. No fiddly cabling required here guys! Just clever construction techniques as per standard from my favourite knitwear designer. 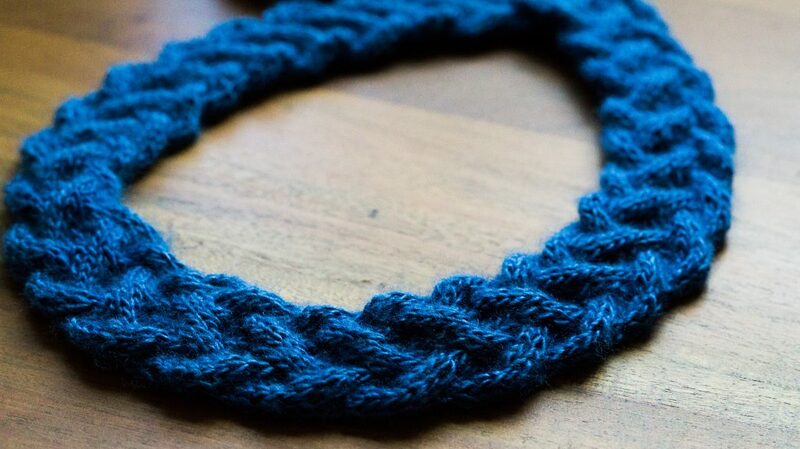 The end result is an undulating, structured but fine-knit necklace. And the Rowan Fine Silk knitted up perfectly for it – I chose 4mm needles which is slightly larger than recommended for the yarn, but created a looser, less dense knit. Exactly what I needed for this necklace! Onto necklace numero duo! And for this one I decided to create my own. I really wanted to try out some cables with this Rowan Fine Silk, having been so impressed with the result of the previous piece. I’ve popped this simple cabled pattern below for free, and you can see how lovely it all turned out! ‘Fine’ is the word – great stitch definition and so light in texture. And the cables really show off the multitone of the peacock blue. Rowan Fine Silk comes in a range of colours (Lime and Teal have particularly caught my eye!). This would be perfect for lacy shawls, or a light spring/summer cardigan. And they’re all available to pre-order here on Laughinghens.com from the 1st July, and available to buy from the 1st August. This pattern is knitted back and forth in rows. Bind off all stitches knitwise. Weave in all ends and sew button at cast on edge. *Laughing Hens sent me a sample of Rowan Fine Silk for an honest review. All opinions are my own.